This beautiful Euro-style home affords your family maximum privacy – no neighbors on either side – jus a beautiful view of the golf course – and no neighbors in the back – just a sparkling waterfront view with a private boat dock. The 6333 Sq. Ft. (heated and cooled) residence sits on approximately one acre at the very end of a cul-de-sac and has an impressive circular drive approaching an iron cathedral door. Walk in and you will feel the influence of olde Europe – yet so comfortable with its stone flooring, winding staircase in the two-story foyer ascending to large open balcony. Lakefront views can be enjoyed through glass walls and doors in the living room, master bedroom, master lounge, family room, kitchen and several bedrooms. Absolutely designed for lakefront living – even the 45’ screened porch with its Summer kitchen. Plenty of room for large business or family gatherings and lots to do! 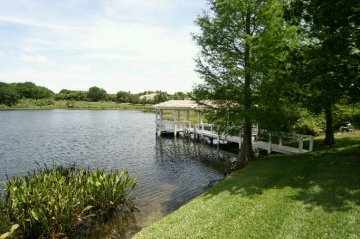 Boating and water skiing at your back door will delight all. 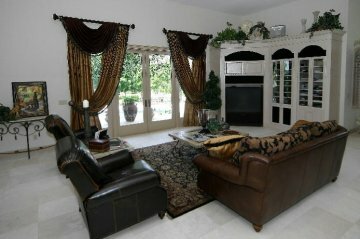 The spacious interior has an open floor plan with spaces defined by stately columns. 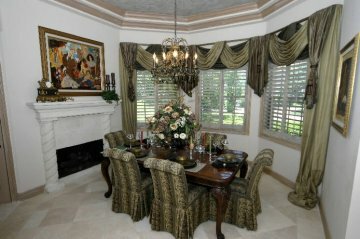 The charming dining room has a stone fireplace and beautiful chandelier. 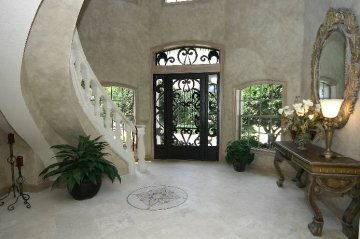 There are four fireplaces in the residence and front and rear staircases. A first-floor master suite has an adjoining sitting room/lounge with French doors opening to the Porch, and also includes a 24’ dressing room, “his” and “hers” closets and a luxurious marble bath with whirlpool tub and separate shower. 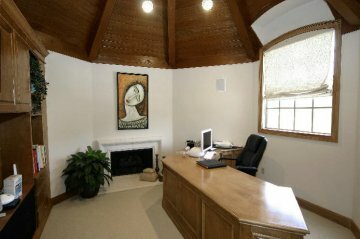 A large room on the first floor has an exterior entry and is currently used as an exercise studio, but could work nicely as a home office – especially with the outside door coming from the circular drive. 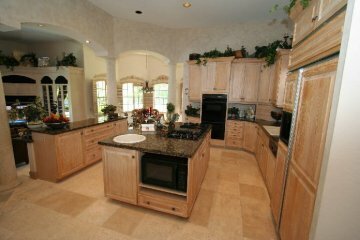 The lakefront kitchen is well designed and crafted with hardwood cabinets topped with granite. A long serving/snack bar flanked by columns separates the kitchen and family rooms. This is a wonderful family area for all to gather – overlooking the lake with French doors opening to the pool, heated spa and screened porch. Florida living at its finest! 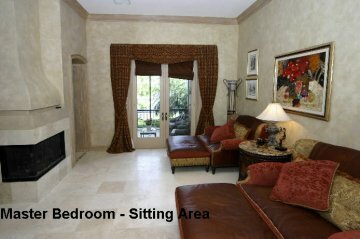 Secondary bedrooms, a handsome gentlemen’s study with fireplace and a media room are located on the second floor. 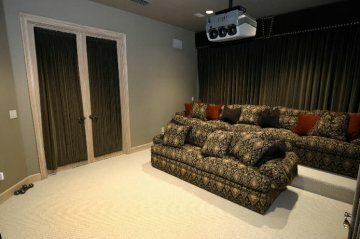 Additional large bonus room with full bath, over the 3-car garage, offers maximum flexibility. 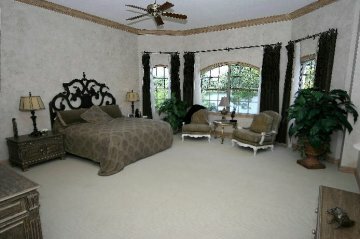 Currently it is used as a private guest suite but could become teen’s quarters, office, nanny’s or staff quarters. There is a total of 6 or 7 bedrooms (depending on how you use the space), 5 full baths and 2 half baths. If you are looking for privacy, quiet location in a country club setting – this is it. Private club membership available with full formal and casual dining facilities, pro shop, 18-hole Arnold Palmer-designed golf course, and the home of Tiger Woods and other notable personalities. All residents have access to the famed Butler Chain of Lakes which is a series of 8 lakes connected by canals. Swimming, boating, water skiing at your back door! Great living awaits you here! $3,800,000.